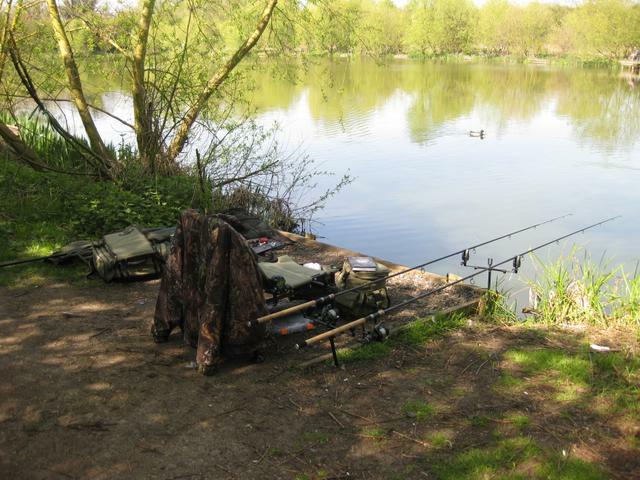 As it was a 1st session and because the British Carp Championships were being held at Thorney Weir ( my 1st choice) I decided to go to Lizard Fisheries near West Drayton as they have 2 lakes one of which is an alleged “runs ” water and I wanted an easy start. Tackle was prepped, sandwiches were made and an alarm was set and at 05:00 the next morning I was stumbling bleary eyed into the car so I could make it to the lake for dawn. On arrival at the lake I realised just how cold it is still, although it has been topping 18 degrees in the middle of the day just before dawn, it was a bone chilling 1.5 degrees and soon all of the coats and fleeces were making an appearance. I may have looked like the Michelin man but at least I was warm, however withing the hours I was really wishing I had brought my thermals and even perhaps a hat and gloves. Let this be a lesson to you all, even though it may be mid 20’s in the middle of the day it is still damn cold in the night / early morning. I had decided to fish the ever reliable CCmoore Meteor and back it up with PVA bags with my super secret spod mix. 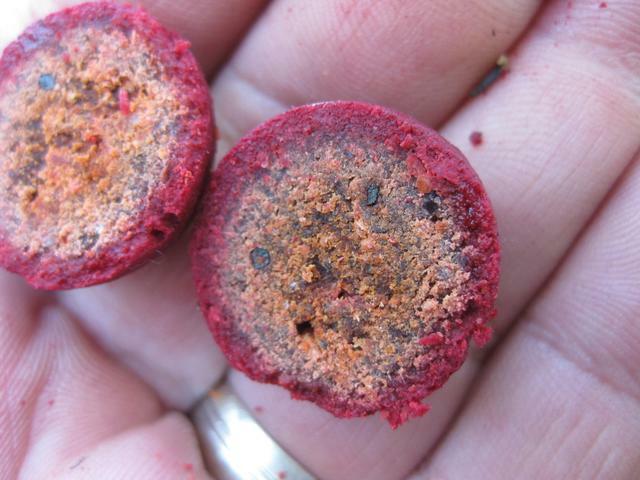 The mix contains a mix of CCmoore Meteor, Bloodworm and Milkimin pellets with about 20% fish meal pellet combined with some boilie chops and a healthy dose of Meteor liquid. As you can see from the pic above the glug had penetrated about 4mm into the boilie but what surprised me was that the center of the boilie appears to have been “bleached” by the glug. Still the carp ( normally) seem not to mind. So how was the session ? well it want the most successful if I am honest. I managed 1 fish which even though it really gave a spirited account of its self ( and even took line) turned out to be a tench of about 5lb’s which in reflection may even be a person best as I haven’t caught one in several years due to their low population density in the Netherlands. In my defence several of the other carp anglers blanked on there and only one carp was brought out whilst I was there. Even the match fishermen were struggling and I certainly did not see any landing nets being used at all. As a 1st session it was enjoyable enough, and on stark contrast to the Dutch carp venues, this one was packed even on a Wednesday, with “colourful” characters. Not speaking Dutch I have been insulated from these people for quite a while. It was entertaining at least to chat to some of the anglers especially one that assured me that one of the other (private) lakes in the vicinity ( which I think I may have a ticket coming soon) was on day ticket. A very confused angler. Yeah you got to love it. Lizards can do that to you. On one day you can catch twenty fish on another zero or even more anoying the swim 5m from you can produce loads while you blank. That water is heavily fished and it pays to fish a little out of the norm. Thanks for that Danor, I see you live in Ruislip. Have you ever fished the lido ? Yes I have twice. The two swims I chose where a bit choked with weed. I blanked on both those sessions. I have been meaining to go back with a rake or in winter sometime. I haven’t quite got around to it just yet. It might be worth giving it a throw for pike this winter. hey, do you have any idea what time you have to leave by in the morning after staying overnight? 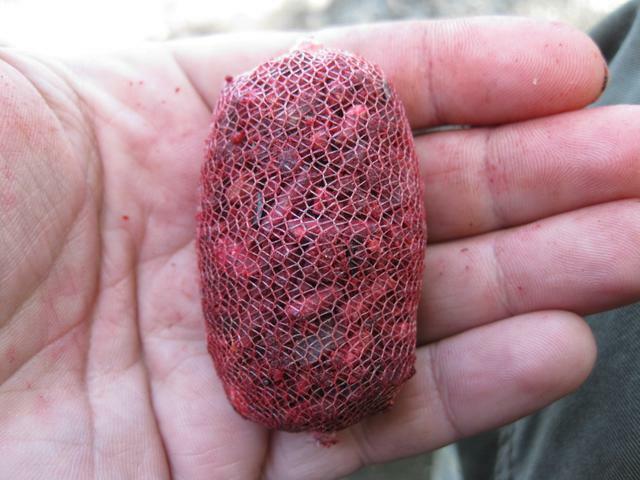 Next Next post: Carp Rigs, How complex do you need to go ?